Right, that's us done for the day. You can catch up on all of the action with Matt Henry's match report over here. We'll be back for 20:00 on Friday to see if England can wrap up this T20 series with a game remaining. England bowler Chris Jordan speaking to Sky Sports about dismissing Darren Bravo: "I just saw it and sprinted towards it! It was a big wicket for us because that partnership was building quite nicely." Chris Jordan, speaking to Sky Sports: "I am the type of player that needs to keep playing cricket and being involved in it as much as possible to keep my rhythm, so it was quite important to play in the PSL and the Big Bash. I feel like I've hit the ground running. "I'm not resigned to playing T20 cricket, I'd love to be involved in the 50-over stuff. If I do get the call in the future then I'm more than happy and more than ready. I can only do what's in front of me at the time." England captain Eoin Morgan: "The bowlers were magnificent - taking early wickets put us on the front foot. It's something we've not been able to do with the white ball on this tour. "Adil Rashid did a fine job today after that. He has proven in the last four years that he can come into the attack at any stage of the game and threaten both edges of the bat. He's a huge asset for us." England batsman Jonny Bairstow: "It was great fun. It was good to get back out and play with a bit of freedom. "There's a few guys not playing in this series so it's an opportunity to go out and hopefully carry on from the one-day series. It's good fun being back behind the stumps, too." And for his 68 off 40 balls, Jonny Bairstow is the man of the match. West Indies captain Jason Holder: "160 wasn't a bad score to chase but we didn't help ourselves in the field. Pooran played well with the bat. He is explosive and very good to watch. I back our lads to bounce back in the next game." First up is West Indies captain Jason Holder. He says it was "a little scrappy" in the field. 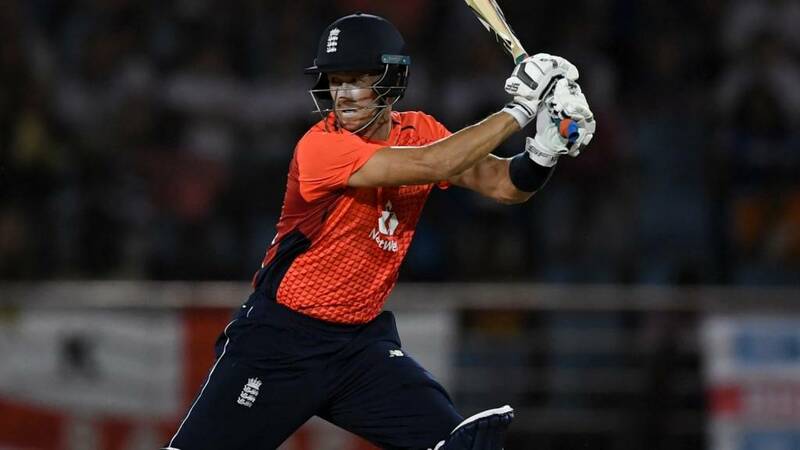 Dave Amitri: Something about Joe Denly makes me think he is the answer at three that allows Jason Roy to be Jason Roy in all formats. A little stutter towards the end, but I reckon England had that under control. Jonny Bairstow set up the chase with 68 from 40 balls, and they were helped by some poor fielding from West Indies. BreakingENGLAND WIN BY FOUR WICKETS! Tom Curran heaves a single to secure victory, and ensure England go 1-0 up in this three-match series. David Willey scampers a single to level the scores. Short from Sheldon Cottrell, whizzing down a bouncer, and Shai Hope cannot cling on to that as it goes bouncing over the gloves. New man Tom Curran scampers off the mark straight away. And he strikes straight away! It's a slower ball from Cottrell, Sam Billings swings - and misses. Wallop.